You’ll be so happy you have now gotten the heads up into this awareness so that you too can reap the very rewards of it over the next few weeks, so we advise it is best that you keep on reading. If you have already signed up under that purple button to the right of your screen, you already know that the approach to another “infamous” Mercury Retrograde is upon us! Even if you are just joining our keeping our eyes on the stars tribe here, you needn’t worry if you think you don’t know anything about Astrology. Whether you are a believer or not, your HEART and soul walks, breathes, and lives upon this very EARTH. If you consider yourself a human being, then you will not be excused from the infamous “as above, so below” that will accompany Mercury’s time for review as he naturally brings forward situations asking for us all to change to over the next few weeks. So exactly what does this “Mercury Retrograde” mean? In a nutshell, he is going to start retracing the measured degrees within his current zodiac transit from above. Think of a person, or in this case a mass of a planet in our Universal energy field, placing a blindfold on. See how things then become ultimately disarrayed as a result down here below? Mercury Retrograde begins officially at 7:56am EDT/4:56am PDT, Saturday 07 June. This planet also is well known as The Messenger –who guides our communications, thinking, mentality, movement, transportation, electricity, and any transference of information down here below- will be up close and personal creating all sorts of “fun” interruptions and flux for us to handle within our normal routines of everyday life until he stations and goes Direct at 8:50am EDT/5:50am PDT, Tuesday 01 July. We cover all the real deal and intimate astrological details on this passage within the very theme of it, Returning to Nurturing Our Perceptions, Mercury’s Reflection in Cancer/Gemini. So again, it is best if you haven’t yet, go over there to your upper right and click on that purple sign up button so you’ll be ensured to always receive even more specific and important information very personal to your soul shortly. 1. We are being asked now to prepare under the Approach, from above, to take up in reflection mode for a few weeks. 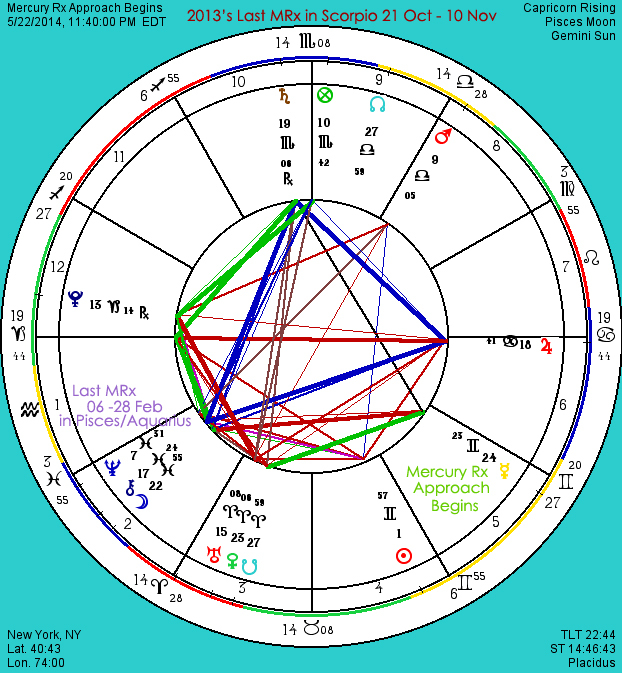 We haven’t had a period like this since 06 to 28 February, when it was our last Mercury Rx in Pisces/Aquarius. Look as well to 21 October to 10 November 2013, Mercury Rx in Scorpio. Think back for a moment. Do you remember now what kinds of interruptions, changes and seemingly “interesting” energies where going on in your life at these times? Reconnect, Review, Reflect, Rework, Revise, Revisit, Reset, Reboot, Rewire, Replace, Repair, Relate, Reaffirm, Redo, Retreat, Reassess, Relax, Relocate, Relive, Redirect, Regroup, Remind, Remember, Release….. and our favorite RESPOND. Backing up, upgrading and updating what you already have placed in motion previously is completely safe to do under this passage. So, if you need a new computer, phone or haven’t saved your files in a long while, these are perfect activities to take advantage of doing for success. 3. While our actions under the Approach are meant to be carefully dealt with, it is the during Retrograde passage itself that is not a favored time to move forward in life, surrounding any initiation you truly wish to have successful long-term results with. So, if you are about to get married, sign important legal documents, buy a car, start a business, purchase a house, partner-up, or put anything out there you want fabulous and fantastic success with for a long time to come- you might want to REthink those choices of your free will. Whatever is put into initiation and motion under Mercury Rx, typically doesn’t have the longevity for the future, for it is riddled upon it’s birth with a shaky ground of unstable communications and mistakes intertwining it’s being. 4. Human error is highest under this passage. Therefore, this is the very key to deeply understand how not to get wrapped up in those “tricks” that do find themselves right at your doorstep. We have to take the extra time to make sure we catch the mistakes we tend to make. The carpenter rule of thumb here will save you every time if you “measure twice, and cut once.” We’ll even add, you might want to measure three or four times- just to be safe. You’ll want to apply this to your communications -i.e. emails, speaking, writing- repairs, cooking, and anything involving movement that you are doing. 5. The practice of PATIENCE, so you CAN TAP IN AN ANCIENT PEACE PACE, is how you ride through the MRx passage with victory. Leave another ten to fifteen minutes every day to get where you are going. Stop the normal rushing that’s become society’s norm to get places. When those changes show up in your plans, don’t REact, REspond. Have back-up plans ready to go you can enjoy the response from. Otherwise the result of reaction will create a domino affect you’d rather avoid under this transit, so be sure your free will chooses cautiously here. Being flexible and adaptable will allow you to have such REward as the next few weeks ask for our pause within our lives. And for heaven’s sake, it is the safest thing really to just RElax and REst without guilt! Try on those RE’s and dive in to what you know already needs REviewing and you’ll sail through this passage all the more. We’ll begin the second Mercury Retrograde of 2014 under a waxing phase from the New Moon in Gemini on 28 May -which will also be under the Shadow of Mars Retrograde in Libra- asking us to take extreme caution within the normal initiation time of our lunar month until 13 June. This “criss-cross” of inner planet retrograde action, continues the long “retrograde train” of inner planet activity since the beginning of 2014. We’ve said it from the beginning, with 2014=7, numerologically this calendar year asks us to go within like we haven’t in quite sometime due to Neptune’s presence here. Astrology is right alongside this request in full agreement for the entire first half of 2014. Check in now where Cancer/Gemini lives in your Zodiac Pie. 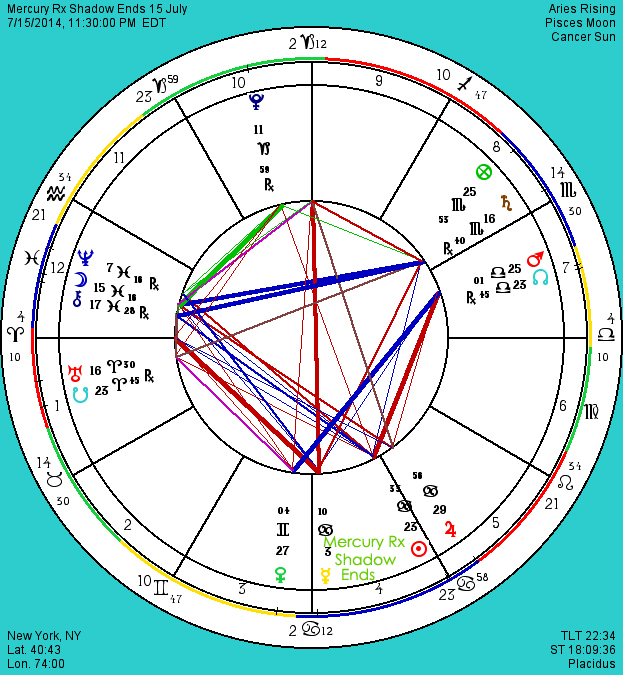 Here’s where the most current and specific calling for re-examination awaits for your review in the particular area of life it affects, from both your collective and natal birth chart perspectives. Remember with all the renewal being requested, you also more than likely are more than deserving of the downtime on the way. As we all look back now to our lives to what has happened since 28 February, see what progress you’ve made, what needs reworking, and most importantly, REmember to have fun with your RE’s of life. Your soul under Retrograde will be all the happier, and much more at peace for it. Happy Returning to Nurturing Your Perceptions Dear Stars! Namaste. Charts for the Approach, Retrograde, Direct and Shadow conclusion of this passage.